Writer-producer Béla Jarzyk debuts with a romantic comedy that begins where romance normally ends; in the divorce court! Pola has had enough of husband Felix’s flings. Not that their friends Wito and Ada and Gustav and Effi are having an easier time of it. Making matters better/worse is Felix’s father, desperately trying to fan the flames of love! Jarzyk, who had already secured lead Christiane Paul and broadcaster Sat.1, then sent the script to Senator Film’s managing director and head of production and distribution, Benjamin Herrmann. Now all Jarzyk needed was a director! 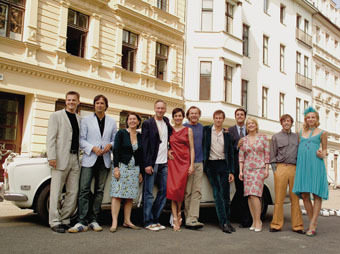 Films such as the crime comedy Die Musterknaben and the comedy Mondscheintarif (also co-produced and distributed by Senator), amply demonstrate that Huettner has “the light touch”.